Directions: In a large bowl, cream butter and sugar until light and fluffy. Add eggs, one at a time, beating well after each addition. Beat in lemon peel and vanilla. Combine the flour, baking soda, baking powder and salt; add to creamed mixture alternately with yogurt, beating well after each addition (batter will be thick). Fill greased or paper-lined muffin cups with 1/4 cup of batter. Bake at 350° for 25-30 minutes (180°C for 19 minutes) or until a toothpick inserted near the center comes out clean. Cool for 10 minutes before removing from pans to wire racks to cool completely. For frosting, cream butter and confectioners’ sugar in a small bowl until light and fluffy. Add the lemon juice, vanilla, lemon peel and milk; beat until smooth. Frost cupcakes.Yield: about 2-1/2 dozen. Nutrition Facts: 1 serving (1 each) equals 244 calories, 11 g fat (6 g saturated fat), 48 mg cholesterol, 178 mg sodium, 34 g carbohydrate, trace fiber, 3 g protein. *** Nutrition facts for cupcakes made with regular sour cream. 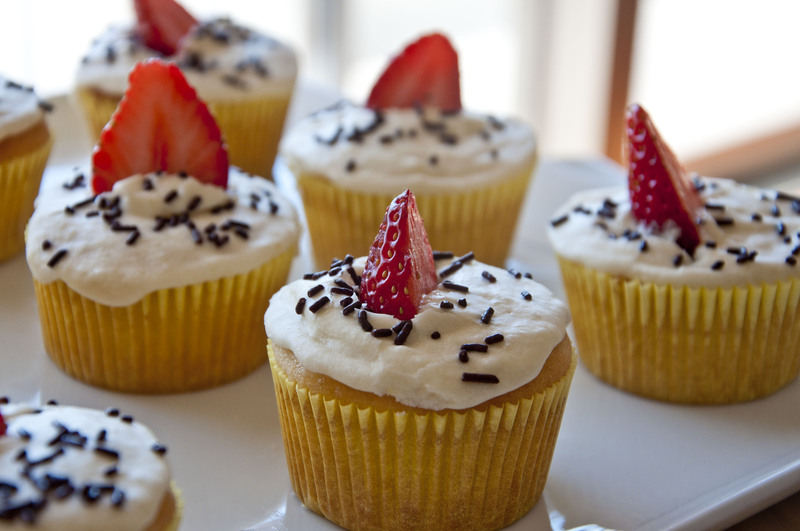 Calorie amount is significantly lower for cupcakes made with plain Greek yogurt.